Above is a close-up picture of a Spanish Heath plant. Note the pine-like leaves and the small bell-shaped flowers. Each bell contains 8 seeds and a large plant can produce well over a million seeds every year! Spanish Heath is an escaped garden plant which is rapidly becoming a serious weed in many areas of Australia, particularly in Victoria and Tasmania. It looks very pretty when flowering but unfortunately it has the potential to completely take over an area and swamp everything else out. Small plants can be simply pulled out. This is best done when the soil is damp and soft. Larger plants can be grubbed out with a mattock. For dense infestations spraying with a herbicide (such as glyphosate) may be the only feasible method. The seeds last a long time (10 years or more) in the ground so you have to be persistent and remove each new crop at least every second year. Note that slashing, mowing or burning will not kill this plant, nor are there any effective biological control methods known. 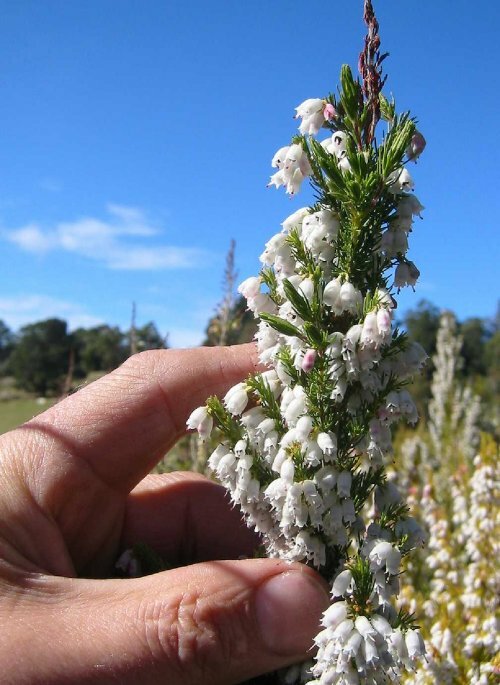 The Department of Primary Industries and Water in Tasmania has formulated a Weed Management Plan for Spanish Heath. (See www.dpiw.tas.gov.au/). Under this plan it is illegal to import, sell, or distribute this plant, and property owners may be required to take certain measures against it. 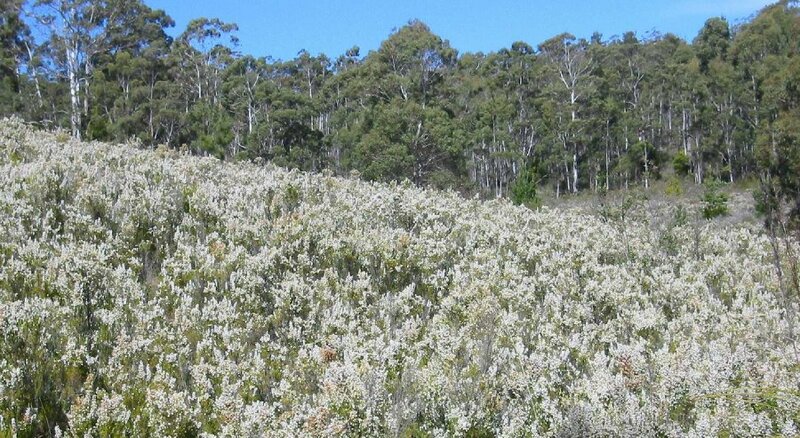 Dense infestation of Spanish Heath at Snug,Tasmania. Flowering occurs throughout Winter and early Spring. This site has been posted to help raise public awareness of this problem weed. 9 September 2002, revised 20 August 2008. This page last updated 24 November 2010.